← 2014 San Francisco Spring Break!! 2014 Limited Edition Spring Welcoming Gifting Tree! Say hello to Spring with these playful new friends! 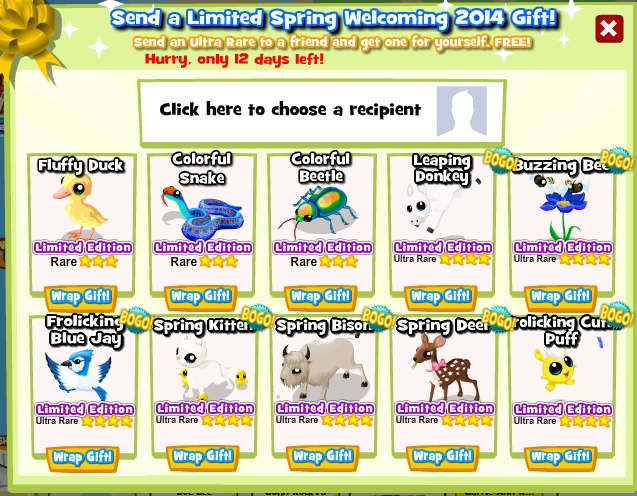 BOGO is back for the new 2014 Spring Welcoming Gifting Tree! Send your Zoomates any of the 7 Ultra Rare animals and get it for yourself, FREE! BOGO animals also come with this season’s NEWEST habitats so be sure to get yours and reveal the new look! Remember after sending your Ultra Rare gift, check your storage to see your free item! Any additional animals of the same will go to your count!